Posted on November 10, 2012, in Commentary, Experimental techniques, Programming, Software, Study Skills and tagged code, coding, Experiments, loops, Matlab, programmer, programming, PsychoPy, python. Bookmark the permalink. 14 Comments. The structure of scripts is simple and intuitive. As a result, new experiments can be written very quickly, and trying to understand a previously written script is easy, even with minimal code comments. We actually had a major problem with PsychoPy and ‘sensitivity’ between machines as well as other bugs. I really wish we had never wandered away from Presentation, Inquisit etc. OpenSesame is impressive and free (as in for the user)…but I think its development is commercially funded by eyetracking device company, which probably helps. Still, PsychoPy was impressive given that it is an all volunteer effort and it seems to work perfectly fine for many things. Very interesting comment – thanks. If you don’t mind, I’d be very interested in hearing more about the issues you had with PsychoPy – can you give us any more information? Just a quick comment to (perhaps) clarify things regarding performance. Assuming that by ‘sensitivity’ you mean that PsychoPy runs much more smoothly on one system than another (more so than performance would vary for other packages), this likely has to do with how PsychoPy generates stimuli, by relying heavily on the graphics card. This means that on some systems performance is poor, *but* … it also means that PsychoPy can do things that, as far as I know, no other stimulus presentation package can. For example, with PsychoPy you can generate drifting gratings on the fly, etc. For this reason, PsychoPy is not the default back-end in OpenSesame (of which I’m the developer), but I nevertheless recommended it to the more advanced users who require the functionality offered by PsychoPy (in which case you can use the PsychoPy libraries from within OpenSesame, more-or-less as you can from the PsychoPy builder view). @st Sorry to hear that you had problems with PsychoPy. Certainly sorry to hear they were bad enough to make you regret switching – that honestly isn’t an impression I’ve heard from many people. There is a mailing list where the developers try to fix any genuine bugs that are found, and generally provide advice. I hope and believe we’re continuing to make improvements as people get stuck. My pleasure – thanks for building some great software! Nicely written review. 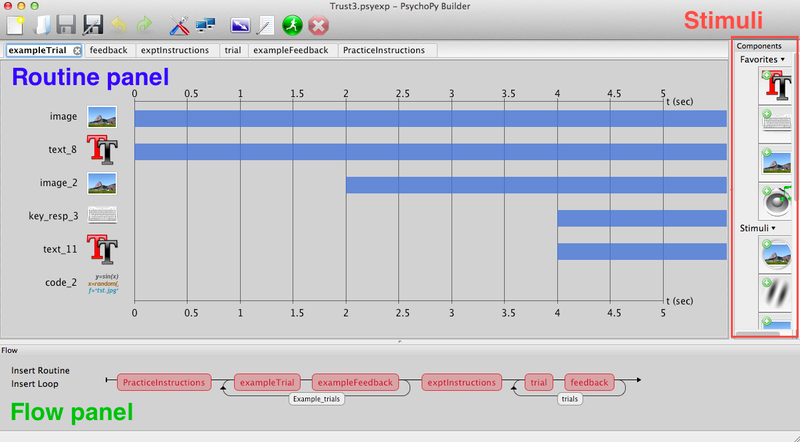 There is a lot to like about PsychoPy, and the Builder is a really nice tool especially to get people started. As the main developer of Psychtoolbox, i want to clarify a few things though. First, at least on Linux and OSX you don’t need Matlab to run Psychtoolbox. It also works perfectly fine with GNU/Octave, a mature, free and open-source Matlab replacement. We used to support Octave on Windows as well, but stopped that for the time being due to apparent lack of interest from our users on that platform. Second, Psychtoolbox, to my knowledge takes more advantage from modern graphics cards than any other toolkit i’m aware of. Last time i checked even way more so than PsychoPy. As such it really benefits from modern graphics hardware, although it should still work reasonably well with 10 years old graphics cards, although it would lose much of the really interesting functionality. The sensitivity to different systems may look like a disadvantage, but i consider it an important feature. By default, Psychtoolbox performs rather extensive tests of your system at the start of each session and during the session, to spot possible flaws in your system. It can workaround or compensate for certain flaws. The idea though is that it is better to abort a session if flaky equipment is detected and give you pointers on how to fix your setup, than to just continue without warnings and let you collect confounded data, where you may measure mostly artifacts from your stimulus presentation or response collection equipment. So it is more sensitive to bad equipment, but this is usually not due to software bugs in Psychtoolbox, but simply because sadly a large fraction of the computing equipment out there, especially operating systems and device drivers, is really somewhat broken and of questionable or insufficient quality for research. You can also disable such correctness tests to get the software running on broken equipment, e.g., for teaching students, running inside Virtual Machines, etc., where research grade precision and robustness doesn’t matter much. Many thanks for the comments – really helpful. I wasn’t aware that Psychtoolbox was supported on Octave, so thanks for that. Also good to know that some of my experiences with psychtoolbox come from it being ‘clever’ and aborting sessions because of hardware limitations – that’s actually pretty great. Hey Matt, i am planning something quite similar with open sesame. To install it on the students laptops. Could you send me some parts of your script, which might be helpful? I am thinking about the screen resolution. How did you fix it, to show the same picture in the middle of the screen on each laptop (assuming different resolutions and screen sizes)? How did you code the logfile (and file with the stored stimuli) ? Did you have a code, which defines that the logfile is a file which is to be found in the same path as the experiment is saved? I’m afraid I know very little about OpenSesame, so may not be of much help. In PsychoPy the default units are basically proportions of the screen size, so if you set the picture size to be x=0.5 y=0.5 it will always cover the same proportion of the screen, no matter what the actual screen size and resolution is. Maybe see if Open Sesame has some similar kind of feature? For the logfile, psychopy automatically creates a ~/data folder wherever the main experimental code is and save the logs in there.